Step 2: Remove the stems and slice tomatoes, cutting the slices in half would make the pressing a bit easier. Step 3: Assemble tomato press. The newer presses I have seen are white and come with a tray to hold the pressed tomato, but an 8x8 pan works well if you have a press like mine. A small or medium sized bowl will work well for the seeds/skins. Step 4: Time to press! As you can see the seeds/skin are on the right side of the picture and the pulp/juice is on the left. If you have a partner in crime, they can feed the press more tomatoes while you turn the handle but you can easily do it yourself. Step 5: Bag juice/pulp. I usually pour the juice/pulp from the 8x8 pan into a liquid measuring bowl with a spout. If you are pressing by yourself you may want to shove the freezer bag into a tall glass and turn the edges under to hold it in place, this holds the bag for you so you can begin to fill it with the juice/pulp. I fill the bags to about 2/3 full. Then carefully close and try to get out any air from bag. Step 6: Into the freezer! Lay flat for easy storage. 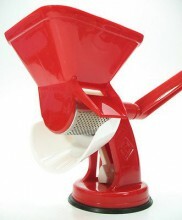 Click the button below to add the Velox Tomato Strainer Made in Italy to your wish list.